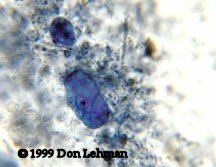 Iodoamoeba butschlii cysts, shown at right, measure between 5 to 20 µm in diameter. The most notable feature is the presence of a large glycogen mass, seen in the image as as a lightly stained area. The karyosome is often prominent and eccentric. Trophozoites of I. butschlii resemble those of Endolimax nana. They measure about 8 to 20 µm and often contain numerous vacuoles.